The server encountered an unexpected error creating performance counters for management agent “adatum.dk”. Performance counters will not be available for this management agent. 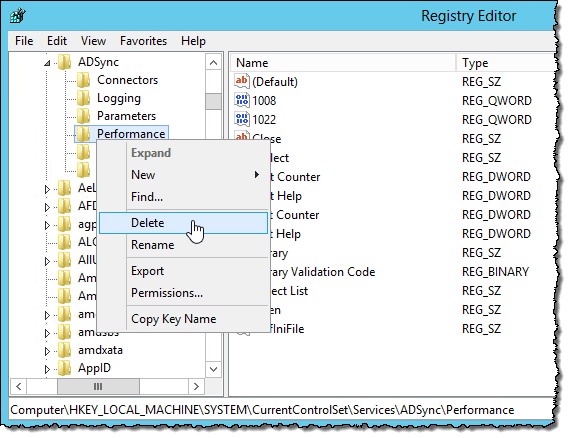 After analyzing the issue in details I found that this occur when AAD Connect installation lack permissions to write performance counter information correctly in the local Registry. To avoid this issue in the first place, always start Azure AD Connect installation or upgrade from an elevated command prompt or an elevated PowerShell prompt. Fixing the issue after Azure AD Connect is installed, require either that AAD Connect is first un-installed and then properly re-installed (from an elevated command prompt), or that the following changes are done to re-register the ADSync performance counters. Next, we need to make a change in the local Registry, but before this ensure that you have a backup of the Registry key. Switch back to the elevated PowerShell prompt and two commands to unload and create the performance counters. Performance counters for the ADSync (Microsoft Azure AD Sync) service were loaded successfully. The Record Data in the data section contains the new index values assigned to this service.